Rainmeter 4.0 has been released on January 1, 2017. 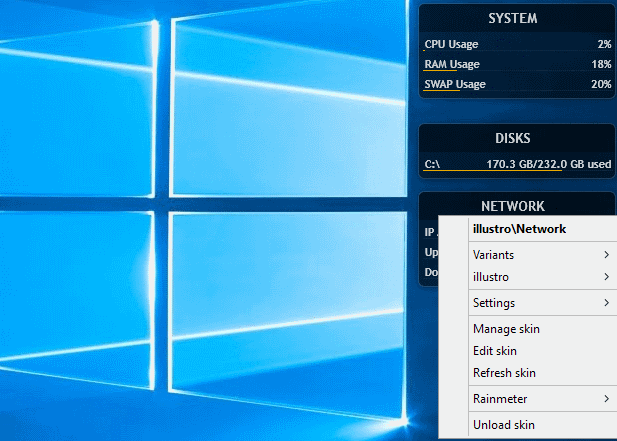 The new version of the popular desktop customization suite ships with new features and options, but also some changes that will affect part of the program's user base. First, the bad news; Rainmeter 4.0 is no longer compatible with Windows XP or Windows Vista. The Rainmeter team asks users who work with the now-unsupported operating systems to stick to the previous release Rainmeter 3.3.2 instead. Additionally, Windows 7 systems need to have the Service Pack 1 and the Platform Update installed to run Rainmeter 4.0. Last but not least, the VirtualDesktops plugin has been removed in Rainmeter 4.0. You may upgrade to the new version by installing version 4.0 over the existing version if you run a previous version of Rainmeter on a device supported by version 4.0. Nothing will be lost or changed according to the team when you do so. So what has changed in Rainmeter 4.0? Most of the changes improve the program's functionality from a creator's point of view. While all users may benefit from these changes eventually, barely anything changed for users who don't create their own skins, modules, or modify existing skins. The closest feature is a new shape meter that Rainmeter 4.0 introduces. It draws shapes using vector graphics, and improves the program's capabilities as it adds more options to draw shapes on the desktop. If you create new skins, you may discover the new skin dialog eventually. It is opened through the manage interface, and opens a dialog to add new skin folders and files to Rainmeter. The new skin dialog should make it easier to add new skins to Rainmeter. Inline String Case -- new type for String meter. Domain / Workgroup -- New SysInfoType value which returns the connected domain or workgroup. Not Enough Substrings -- Added option to suppress "not enough substring" errors. User Agent String -- Added option to the WebParser to set a custom user agent string. HTTP Headers -- Added option to WebParser to add custom HTTP header fields. Auto Select Screen -- Added AutoSelectScreen and AutoSelectScreenGroup bangs. 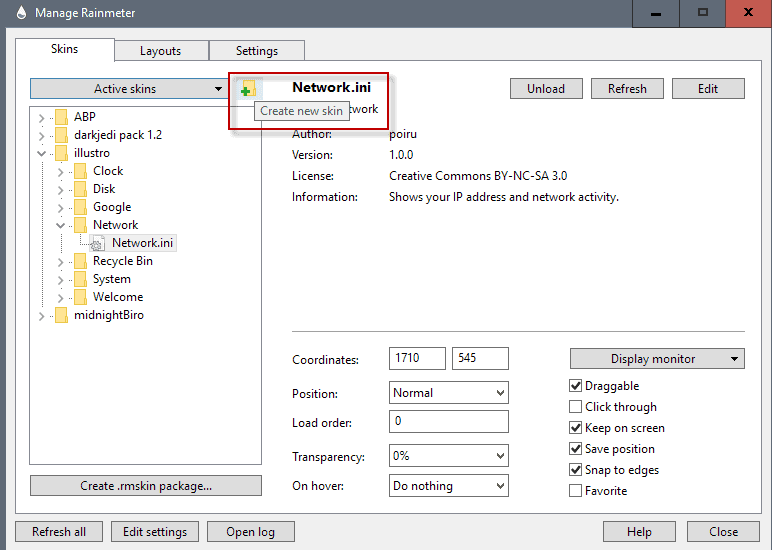 Network Adapter Type -- Added new Adapter Type SysInfoType option to the SysInfo plugin. Returns the adapter type. Limiting InputText -- Option to limit the number of characters, or enforce only numeric characters. Rainmeter 4.0 ships with a number of fixes and improvements on top of that. You can check out the full release notes on the official Rainmeter website. Now You: Do you use Rainmeter? What's your take on the changes?